SwiftKey's new keyboard just got even smarter, with double-word prediction increasing your typing speed by, well, double. The new feature is currently in the beta version of SwiftKey 6.0, which you can download now, and the firm claims its improved prediction engine will result in faster typing. As you start knocking out your missives you'll notice at times the keyboard will offer up two words in the prediction bar as well as single words. We suspect it may take SwiftKey longer to learn these double word suggestions, and the first few times you use it could see some strange combinations offered up. 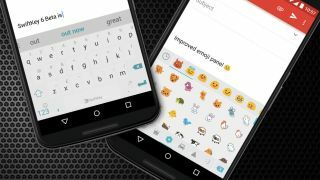 There's good news for emoji fans too, as SwiftKey has improved the accessibility to everyone's favourite mini images in version 6.0. We're still waiting to see the likes of taco and middle finger though. SwiftKey is now available on iPhone too after Apple opened up the doors to third-party keyboard makers, but the bad news if you won't be able to give the beta version a whirl. You'll have to wait for the full release later this year.